For many of us, going to the farmers’ market requires a commitment. You have to wake up early on Saturday morning to beat the crowd and drive 30 minutes to get those fresh peaches or ripe strawberries. At a good farmers’ market, the choices can be overwhelming, so you really have to focus. 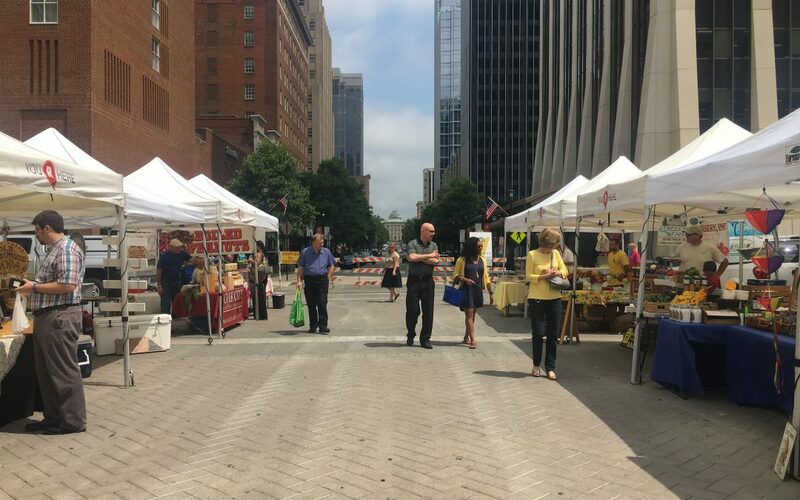 If you’re one of those who feels like visiting the farmers’ market can be a chore, the Downtown Raleigh Alliance wants to change that with the Downtown Raleigh Farmers Market. This market is open every Wednesday from 11am-2pm. Located in City Plaza in the heart of downtown, vendors offer a broad range of locally-grown produce and goods like flowers and pastries. Surrounded by large office buildings, downtown employees are encouraged to explore the market and its offerings during lunch breaks. I traveled to downtown Raleigh to check out the market for myself and here is what I found! 4 farmers market finds that may surprise you. 1. There’s a lot of stuff there! From fresh pastries to bunches of flowers to live music, there is a lot to look at and explore. Each week, the Market has its own booth that features a local nonprofit and educates the community on topics ranging from sustainability to gardening. In addition to their usual offerings, the Market also hosts special events like A Festival of Flowers and Tomatolicious. 2. It is convenient and accessible. Located on Fayetteville Street, the Market is within walking distance of many major downtown restaurants, attractions, and businesses. If you’d rather not walk, take the R-LINE. It is free and eco-friendly. Buses run every 15 minutes, and you can get more information about stops here. In addition to these options, there is plenty of parking available here. 3. We need to support our local farmers. As I was walking around the market, I spotted peaches at one of the vendors’ tents. I walked over and ended up chatting with the farmer about his peaches. He explained that out of their 30 trees or so, they were only able to pick around 40 peaches which was all he had on the table in front of him. He said the late frost this year hit them hard and affected many of their other crops too. After hearing what he had to say, I felt inclined to buy peaches, and I even bought some corn, too. As I left the market, I began thinking about how many of farmers’ livelihoods are so dependent on things that are out of their control and yet they continue to provide food that sustains us. Think about that the next time you are at the grocery store or a farmer’s market and you have the chance to buy local produce. 4. Fresh produce tastes better. Of course, this is a matter of personal opinion, but I swear the tomatoes that I bought at the farmer’s market were the best tomatoes I have ever had. Maybe it’s the “localness” or the TLC that goes into growing and harvesting the crops, but I think almost everything from local vendors tastes better than anything you can get at the grocery store. So if for no other reason than to benefit your taste buds, buy local! If you are looking for a farmers’ market near you, here are some in the Triangle and surrounding areas: Apex, Cary, Holly Springs, North Hills (Raleigh), State Farmers’ Market, Wake Forest, Western Wake, Pittsboro, Siler City, Durham, South Durham, Dunn, Chapel Hill, Eno River (Hillsborough), and Carrboro.